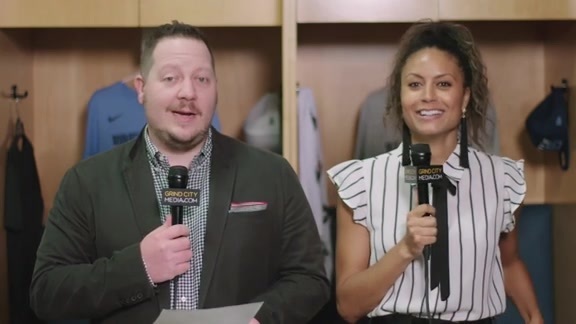 Alexis Morgan and Lang Whitaker recap the Grizzlies matchup with the Bucks. 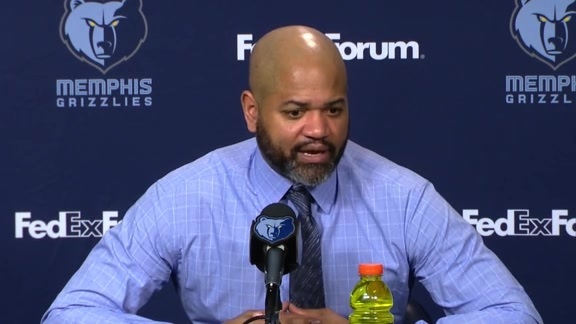 Listen to what coach J.B. Bickerstaff had to say following the Grizzlies match against the Bucks on Wednesday night. 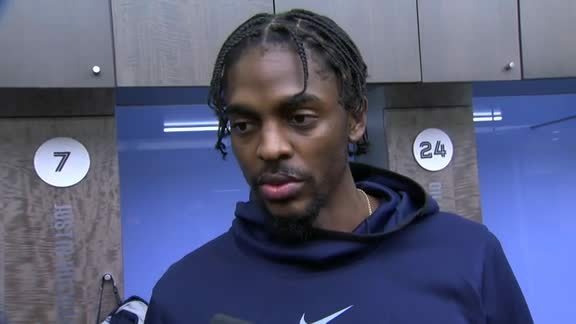 Justin Holiday shares his take on what happened during tonight’s game against the Bucks. Omri Casspi shares his take on what happened during tonight’s game against the Bucks. 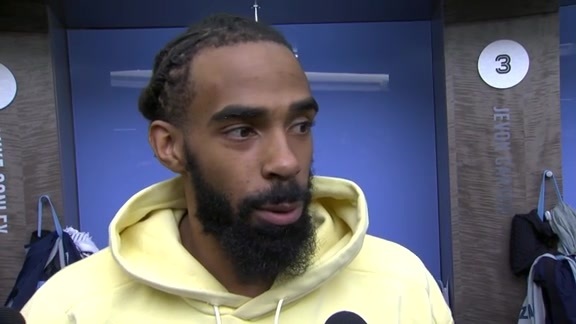 Grizzlies guard Mike Conley talks with reporters following Wednesday’s matchup against the Bucks. 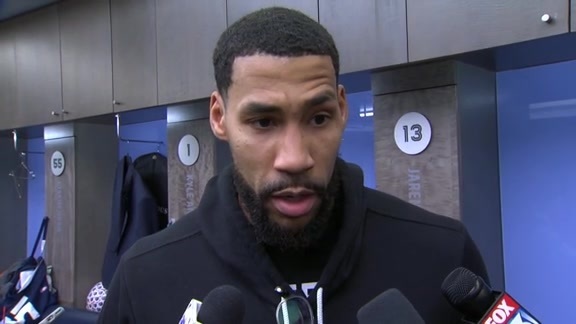 Garrett Temple shares his take on what happened during tonight’s game against the Bucks. Check out all the action from Wednesday night’s game against the Bucks in Memphis. 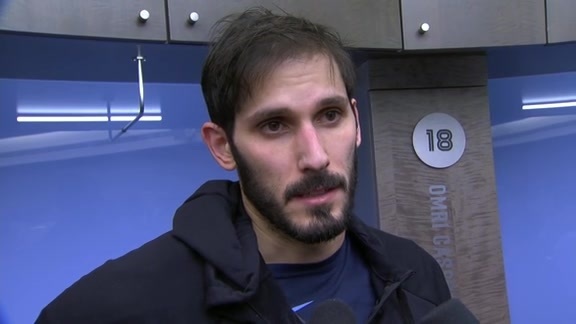 Omri Casspi had 17 points, 6 rebounds, and 2 assists in the Grizzlies’ 101-111 loss in Memphis. Watch Jevon Carter sneak by and somehow find a way to sink it in and draw the foul. Watch the Rabb-Carter-Rabb combo convert into points off Ivan Rabb's finger roll. Watch Shelvin Mack pull up and fire from long distance. 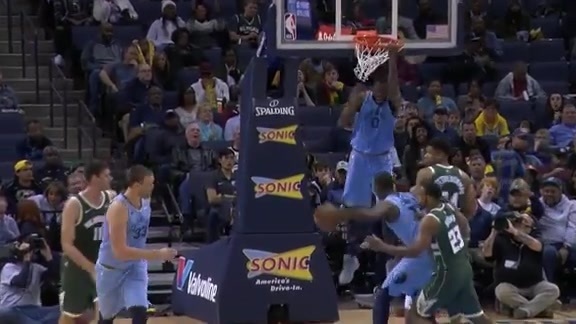 Watch as Jaren Jackson Jr. flies in and around his defenders for two. 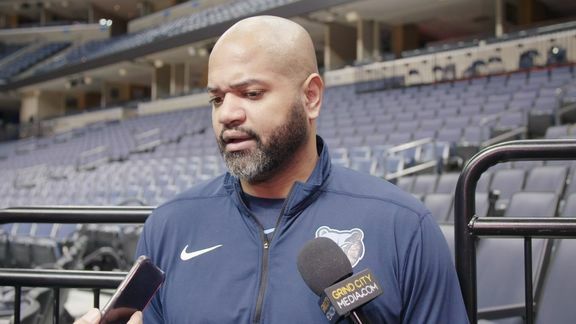 J.B. Bickerstaff speaks to the media ahead of the Grizzlies matchup against the Bucks at FedExForum. Milwaukee shot 23-for-44 (.523) from the floor during the second half, including going 9-for-20 (.450) from three-point range, to score 61 points in the half. Milwaukee exploded for a 19-0 run from 7:47 to 3:42 (4:05 run) in the third quarter, with 12 of the points coming from Bledsoe, to extend their lead to 77-59. The Grizzlies wouldn’t get within single-digits for the rest of the game. The Milwaukee Bucks, powered by a 41-point third quarter, defeated the Memphis Grizzlies 111-101, on Wednesday night in FedExForum. The Grizzlies fell to 19-25 on the season and are now 11-10 at home. Memphis has dropped nine of their last ten games. The Bucks improved to 32-12 on the year. The Bucks have now won 23 games by double-digits, the most in the NBA this year. Milwaukee is now 5-0 when playing a team that defeated them earlier in the season. Milwaukee shot 23-for-44 (.523) from the floor and 9-for-20 (.450) from three-point range in the second half, while handing out 16 assists, to score 61 points in the half. Omri Casspi came off the bench to lead the Grizzlies in scoring for the second time this season, scoring 17 points to go with six rebounds. Casspi has reached double figures for the seventh time this year, and marks the first time this season he’s done it in back-to-back games. JaMychal Green recorded his fifth double-double of the year with 14 points, 10 boards and a game-high three blocks. Mike Conley and Marc Gasol each finished with 14 points. Shelvin Mack supplied 11 points and a game-high six assists. The Bucks finished the game shooting 40-for-84 (.476) overall and 12-for-34 (.353) from three, while the Grizzlies were only 37-for-95 (.389) from the field and 10-for-31 (.323) beyond the arc. Both teams capitalized on mistakes, as Memphis scored 22 points off of 16 Milwaukee turnovers, while the Bucks had 25 points off of 15 Grizzlies miscues. The teams combined for 20 steals and 17 blocks in the game. Giannis Antetokounmpo led all scorers with 27 points to go with 11 rebounds. Antetokounmpo now has 30 double-doubles on the season. Eric Bledsoe finished with 16 points, with 12 of them coming in the third quarter. D.J. Wilson added 13 points off the bench. Khris Middleton and Sterling Brown both finished with 11 points. Milwaukee burst out of halftime by dropping 41 points in the third quarter, a season-high by an opponent in any quarter, on 16-of-25 (5-8 3P) shooting. The Grizzlies shot well enough in the third, going 11-for-21 (5-6 3P), but committed eight turnovers which led to 20 points for the Bucks. Conley and Gasol knocked down back-to-back threes to give the Grizzlies their first lead of the game at 59-58 with 8:09 left in the period. Milwaukee went on a 19-0 run from 7:47 to 3:42 (4:05 span), with 12 of the points coming from Bledsoe, to take a 91-73 lead at the end of the quarter. 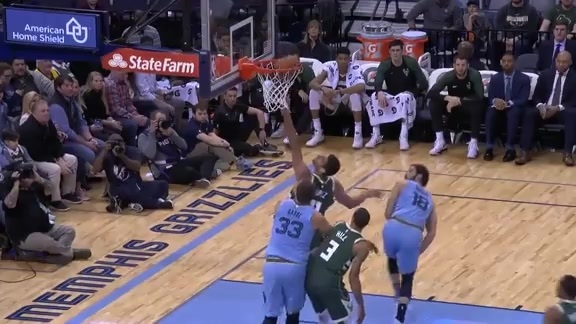 The Grizzlies outscored the Bucks 28-20 in the fourth quarter, and forced them into seven turnovers, but the deficit was too much at that point to overcome. The Grizzlies slow start to the game hindered their shooting numbers in the first half, making 17-of-51 (.333) shots while the Bucks connected on 17-of-40 (.425). Neither team could do much from beyond the arc in the half, with the Grizzlies going 2-for-15 (.133) and the Bucks shooting 3-for-14 (.214). The Memphis bench was key during the half, providing 26 points (11 by Casspi) compared to 11 by Milwaukee’s bench. Both teams scored 22 points in the paint. Antetokounmpo had 15 points (6-7 FG) and seven rebounds at the break. Memphis was cold on offense to start the game, making just one of their first 11 shots, allowing Milwaukee to open the game with a 14-4 run in the first quarter. The shooting struggles continued in the quarter, as the Grizzlies shot 7-for-27 (.259) from the field while the Bucks went 8-for-19 (.421). The Grizzlies’ field goal percentage in the first quarter was a season-low. Both teams shot a combined 3-for-15 (.200) from three in the quarter. The Memphis bench scored 14 points in the quarter. 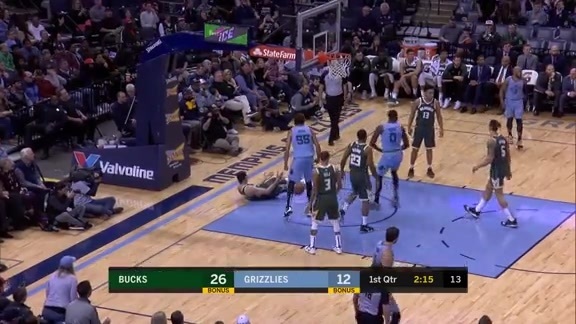 The Grizzlies closed the first strong by going on an 8-0 run over 1:19 (2:15 to 56.8), highlighted by a Green and-1 dunk, to trim the Bucks lead to 28-20. The Grizzlies’ momentum at the end of the first quarter carried over into the second, shooting 10-for-24 (.417) from the floor despite missing all six three-pointers. The Bucks went 9-for-21 (.429) overall and only 2-for-8 (.250) from three. Memphis converted five Milwaukee turnovers into eight points in the quarter, while conceding two points on three giveaways. Both teams blocked four shots in the quarter. Antetokounmpo dropped 10 points on a perfect 4-for-4 shooting in the period to help the Bucks lead 50-45 at halftime. The Grizzlies will head northeast for a pair of games, starting with the Boston Celtics on Friday, January 18 in TD Garden at 6 p.m. CT. Tune in to FOX Sports Southeast presented by Pinnacle Financial Partners or listen on 92.9 FM ESPN to follow the action. Eight turnovers for 20 points. It’s pretty simple. Unforced turnovers, live ball turnovers at the top of the floor that lead to transition dunks, easy buckets. We told the guys we have to participate in our own rescue. That’s not how you do it. You can’t continue to kick yourself when you’re down. 41 points they had in that quarter, 20 of them came off our turnovers. You can’t survive that. We need him to play well. We need him to be comfortable so that he can contribute at the level that we think he can. We’ll never do anything to the detriment of the team but when you make a trade for a guy, there’s a commitment to give him some sort of opportunity. A guy with a track record. A guy with a background. It’s not as if we found him off the streets. He’s got a history of productivity. We’ve got to work with him on off days, practice days, get him caught up to speed and then whatever help he needs we’ve got to be there to give it to him and be supportive. It’s difficult. It’ difficult when you get traded and it’s difficult when you’re not making shots or the thing that you’re used to doing doesn’t come naturally. It’s hard. We’ve got to be there to help him. His teammates have got to be there to support him but we need his productivity. Frustrated. Clearly, not the way we like games to end. There is a level of guys that are pissed off which I think we should be. It’s not a ‘quit’, it’s not a ‘give in’, it’s not a ‘pack your tent and go home’. So again, we’ll show up tomorrow. We’ll work. We’ll show up Friday and we’ll work. That’s all that we can do. We have to improve. We have to play better. We’ve shown in stretches that we can play well. We’ve got to play well longer. Execution. I felt comfortable where we were and the things that we were doing and how we create more of those positive situations. The pick-and-roll defense where they do drop and it frees him up for some open looks, how do we get back there? Defensively, how do we keep the ball in front of us, keep them out of our paint, find our shooters? When we get some momentum, those are the situations where we cannot kick ourselves and following that there was a rash of turnovers that sparks them. They’re a fast, athletic team. When you turn it over they can hit you over the head quickly. I think it’s part human nature when you’re down and negative thigs start to happen, you have to find a way to be more resilient. We can’t afford to feel sorry for ourselves in those moments. We can’t hang our head. Trying to get guys to understand how important the present moment is and the last possession has absolutely nothing to do with the next possession. That’s what we have to be able to shake off. The last game versus Houston had nothing to do with the game tonight. Tonight’s game has nothing to do with Boston. This first quarter has nothing to do with Boston’s first quarter. That’s the mindset that we have to have. Every single moment is valuable. Every possession is precious but the last possession has no influence on the next one and that’s the mindset we’ve got to get to. I was just trying to bring energy. We needed to get the crowd going and the bench going a little bit, but I’ve never been in a game with so many swings. Being down two and then going down 30 and coming back to down 10. So, it was weird. There were a lot of open threes and they made some shots. At this point we’ve got to slow the game down a little bit. Maybe get a foul and try to get back in it and into our rhythm. I felt like the game kind of got away from us. We were playing at their speed with a lot of turnovers, and when they go out on a run, our defense can’t get set and it’s tough on our defense. It’s part of the NBA. You’ve always got to be ready, stay in shape and stay in rhythm. When the opportunity is there for you, you’ve got to perform. Omri Casspi came off the bench to lead the Grizzlies in scoring for the second time this season, scoring 17 points to go with six rebounds. Casspi has reached double figures for the seventh time this year, and marks the first time this season he’s done it in back-to-back games. JaMychal Green recorded his fifth double-double of the year with 14 points, 10 boards and a game-high three blocks. Mike Conley finished with 14 points. 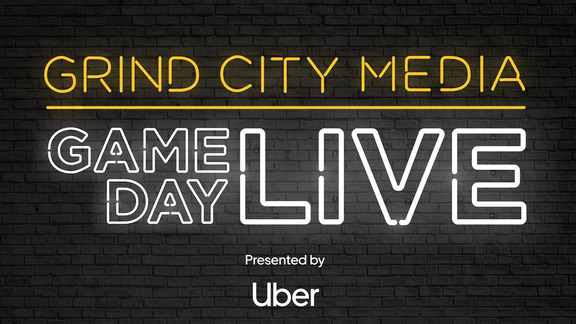 Since he was held scoreless against Detroit on Jan. 2, Conley has averaged 19.8 points in the seven games since. Marc Gasol scored 14 points to go with five assists. Gasol has handed out at least five assists in 19 games this year. Shelvin Mack chipped in with 11 points and a game-high six assists off the bench. Giannis Antetokounmpo led all scorers with 27 points to go with 11 rebounds. Antetokounmpo now has 30 double-doubles on the season. Memphis shot 7-for-27 (.259) in the first quarter, setting a season-low for field goal percentage in an opening quarter. Milwaukee scored 41 points in the third quarter, the most by a Memphis opponent in any quarter this season. 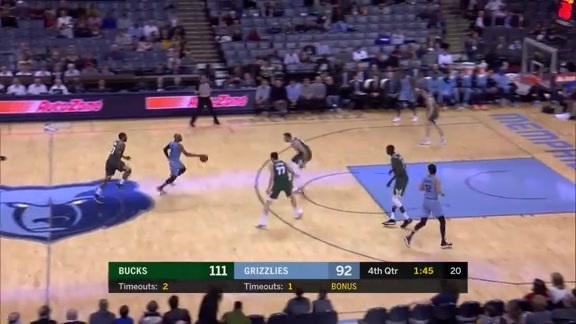 Both teams capitalized on mistakes, as Memphis scored 22 points off of 16 Milwaukee turnovers, while the Bucks had 25 points off of 15 Grizzlies miscues. The Grizzlies have now dropped nine of their last ten games. The Bucks have won 23 games by double-digits, the most in the NBA this year. Milwaukee is now 5-0 when playing a team that defeated them earlier in the season.